This article is about the chemical substance. Water covers about 71 percent of the Earth's surface; the oceans contain about 97 percent of the Earth's water. The Antarctic ice sheet, which contains 90 percent of all freshwater on Earth, is visible at the bottom. Condensed atmospheric water can be seen as clouds, contributing to the Earth's albedo. 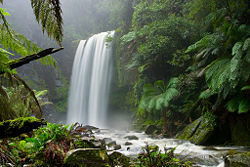 Hopetoun Falls near Otway National Park, Victoria, Australia. Water is a common chemical substance that is essential for all known forms of life. In typical usage, the term water refers to its liquid state, but the substance also has a solid state, ice, and a gaseous state, water vapor. About 71 percent of the Earth's surface is covered by water, mostly in oceans and other large water bodies. The presence of water on Earth depends on various factors, including the Earth's location in the Solar System. If Earth were about 5 percent closer to or farther from the Sun, there would have been a much lower likelihood for the three forms of water to be present on this planet. Also, the Earth's mass is appropriate for gravity to hold an atmosphere, in which water vapor (along with carbon dioxide) helps maintain a relatively steady surface temperature. 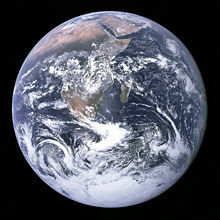 A smaller Earth would have a thinner atmosphere, causing temperature extremes and preventing the accumulation of water except at the polar ice caps. If Earth were much more massive, the water on it could have been in the solid state even at relatively high temperatures, because of the high pressure caused by gravity. Water moves continually through a cycle of evaporation or transpiration, precipitation, and runoff, usually reaching the sea. Winds carry water vapor over land at the same rate as runoff into the sea, about 36 Tt per year. Over land, evaporation and transpiration contribute another 71 Tt per year to the precipitation of 107 Tt per year over land. Some water is trapped for varying periods in ice caps, glaciers, aquifers, or in lakes, sometimes providing freshwater for life on land. Water is a good solvent for a wide variety of substances. Humans use water for many purposes, including drinking, cooking, cleaning, heating, and cooling. We find it valuable for scientific experimentation and industrial processes as well as for agriculture. In addition, we use water for various sports and recreational activities. In various religions, water is considered a purifier in an internal, spiritual sense as well as in an external, physical sense. Also, the Jordan River, Ganges River, and other bodies of water are considered sacred by people of certain religions. Yet, water pollution, overconsumption, and uneven distribution have resulted in shortages of clean freshwater in many parts of the world. These shortages have in turn led to disputes between peoples of different nations. Beyond the Earth, a significant quantity of water is thought to exist underground on the planet Mars, on Jupiter's moon Europa and Saturn's moon Enceladus, and on the exoplanets named HD 189733 b and HD 209458 b.
Trillium Lake in the Mt. Hood National Forest, near Portland, Oregon. Water is a chemical compound with the chemical formula H2O. Each molecule of water consists of two hydrogen atoms covalently bonded to a single oxygen atom. At ambient temperature and pressure, water is a tasteless, odorless liquid. It appears colorless in small quantities, but it has an intrinsic very light blue hue. Pure ice also appears colorless, and water vapor is essentially invisible as a gas. Water is primarily a liquid under standard conditions—a property that makes it different from other analogous hydrides of the oxygen family in the periodic table. Those hydrides, such as hydrogen sulfide, are gases. Also, the elements surrounding oxygen in the periodic table—namely, nitrogen, fluorine, phosphorus, sulfur and chlorine—all combine with hydrogen to produce gases under standard conditions. Many of the properties of water can be explained by the polar nature of its molecules. The oxygen atom is strongly electronegative, and within each water molecule, the oxygen atom draws electrons closer to itself, away from the hydrogen atoms. As a result, there is a partial negative charge (δ-) near the oxygen atom and a partial positive charge (δ+) near each hydrogen atom. Thus the entire molecule is polar, with a net dipole moment. Due to this polarity, there is electrical attraction between water molecules, pulling them closer to one another. This attraction is called hydrogen bonding. The hydrogen bonds between water molecules raise the boiling point of water and cause it to be a liquid at room temperature and pressure. By contrast, hydrogen sulfide is a gas under the same conditions because of the absence of such hydrogen bonds between its molecules. Water is involved in common acid-base reactions. An acid (more precisely, a Brønsted-Lowry acid) is a donor of hydrogen ions (H+, or proton), and a base (Brønsted-Lowry base) is a hydrogen ion acceptor. When the base is a hydroxide ion (OH−), its reaction (neutralization) with an acid produces water (HOH). Some water molecules react with one another to produce hydronium ions (H3O+(aq)) and hydroxide ions (OH−(aq)). In this case, one water molecule acts as an acid and donates a hydrogen ion to another, which acts as a base. Water is also the usual standard for the measurement of pH—a quantity defined as the negative logarithm of the hydrogen ion concentration. When the pH of water (or a solution) is 7, it is said to be "neutral"—neither acidic nor basic. Acids (and acidic solutions) have pH values less than 7; bases (and basic solutions) have pH values greater than 7. Dew drops adhering to a spider web. Given the polar nature of water molecules, water tends to stick to itself—a property known as cohesion. At the same time, the polar nature of water molecules also explains the ability of water to stick to other surfaces—a property known as adhesion. For example, water may form a thin film on clean, smooth glass because the adhesive forces between glass and water molecules are stronger than the cohesive forces. In biological cells, water tends to stick to hydrophilic (water-attracting) surfaces of proteins and membranes. To dehydrate hydrophilic surfaces—that is, to remove the strongly held layers of water—requires doing substantial work against these forces, called hydration forces. These forces are particularly important when cells are exposed to dry atmospheres or during extracellular freezing. 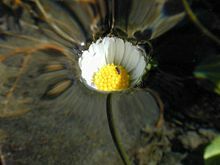 This daisy is under the water level, which has risen gently and smoothly. Surface tension prevents the water from submerging the flower. Water has a high surface tension caused by the strong cohesion between water molecules. This can be seen when small quantities of water are put onto a non-soluble surface such as polythene; the water stays together as drops. Just as significantly, air trapped in surface disturbances forms bubbles, which sometimes last long enough to transfer gas molecules to the water. Another surface tension effect is capillary waves. These are the surface ripples that form from around the impact of drops on water surfaces, and sometimes occur when strong subsurface currents flow to the water surface. The apparent elasticity caused by surface tension drives the waves. Capillary action refers to the process of water moving up a narrow tube against the force of gravity. It occurs because (a) water adheres to the sides of the tube; (b) surface tension tends to straighten the surface, making the surface rise; and (c) more water is pulled up through cohesion. The process is repeated as the water flows up the tube, until the water reaches a level where gravity counteracts the adhesive forces. 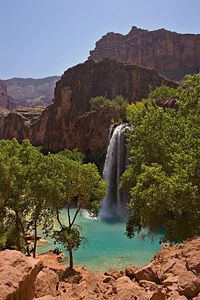 High concentrations of dissolved lime make the water of Havasu Falls appear turquoise. Water is a very strong solvent and dissolves many types of substances. It has therefore been called the universal solvent. Substances that will mix well and dissolve in water (such as salts) are known as "hydrophilic" (water-loving) substances; those that do not mix well with water (such as fats and oils), are called "hydrophobic" (water-fearing) substances. The ability of a substance to dissolve in water is determined by whether or not the substance can match or better the strong attractive forces that water molecules generate among themselves. If the properties of a substance do not allow it to overcome these strong intermolecular forces, the molecules are "pushed out" from the water and do not dissolve. Pure water has low electrical conductivity, but it increases significantly upon solvation of even a small amount of ionizable material, such as hydrogen chloride. Thus the risks of electrocution are much greater in water with the usual impurities not found in pure water. Any electrical properties observable in water are from the ions of mineral salts and carbon dioxide dissolved in it. Some molecules of water dissociate into ions, producing hydroxide anions and hydronium cations, as noted earlier. This dissociation is at a very low level in pure water, so the water will not carry enough electric current to do any work or cause any harm for most operations. In pure water, sensitive equipment can detect a very slight electrical conductivity of 0.055 µS/cm at 25 °C. Water can also be electrolyzed into oxygen and hydrogen gases, but in the absence of dissolved ions this is a very slow process, as very little current is conducted. Hydrogen has three isotopes. The most common isotope, present in more than 95 percent of water, has 1 proton and no neutron in the atomic nucleus. A second isotope, deuterium (or "D"), has 1 proton and 1 neutron. Water that contains deuterium (D2O) is also known as heavy water and is used in nuclear reactors for storing nuclear wastes. The third isotope, tritium (or "T"), has 1 proton and 2 neutrons in the atomic nucleus, and is radioactive. Water that contains tritium (T2O) does not exist in nature, as the creation of the molecule would result in its almost instantaneous decomposition. D2O is stable, but it differs from H2O in being denser. Also, it can block alpha and beta rays. D2O occurs naturally in water at very low concentrations. Consumption of pure isolated D2O adversely affects biochemical processes: ingestion of large amounts impairs kidney and central nervous system functions. Water has the second highest specific heat capacity of any known chemical compound, after ammonia. In addition, it has a high heat of vaporization (40.65 kJ mol−1). Both these properties are a result of the extensive hydrogen bonding between its molecules. These two unusual properties allow water to moderate Earth's climate by buffering large fluctuations in temperature. A simple but environmentally important and unusual property of water is that its solid form, ice, floats on its liquid form, because ice has a lower density than liquid water. By contrast, for almost all other substances, the solid form has a higher density than the liquid form. This property of water can be explained as follows. When freshwater is cooled, it increases in density, and the cooler water sinks below the warmer layers by convection. This continues until the water reaches a temperature of 3.98 °C (at standard atmospheric pressure), at which stage water reaches its highest density. Further cooling lowers the density of water, because of the geometry of the hydrogen bonds formed between the molecules. When some of the water freezes, the ice that is formed floats because of its lower density. When a body of water such as a lake begins to freeze, ice forms first at the surface and progresses downward. Water in the deeper regions of the lake remains warmer than that near the top. The layer of ice at the top effectively insulates the lake floor from the cold, protecting the fish and other living organisms from freezing to death. Although water freezes at 0 °C (32 °F, 273 K), it can be supercooled in a fluid state down to its crystal homogeneous nucleation at almost 231 K (−42 °C). Ice also has a number of more exotic phases not commonly seen (see Ice). The triple point of water is the combination of pressure and temperature at which pure liquid water, ice, and water vapor can coexist in a stable equilibrium. The phase diagram of water has several triple points, of which the most familiar one is used to define the kelvin (K), the SI unit of thermodynamic temperature. As a consequence, this triple point temperature is a prescribed value rather than a measured quantity: 273.16 K (0.01 °C) and a pressure of 611.73 pascals (approximately 0.0060373 atm). This triple point is approximately the combination that exists at 100 percent relative humidity at sea level and the freezing point of water. Gustav Heinrich Johann Apollon Tammann in Göttingen produced data on several other triple points in the early twentieth century. Kamb and others documented further triple points in the 1960s. Water is miscible with many liquids, for example ethanol in all proportions, forming a single homogeneous liquid. On the other hand water and most oils are immiscible usually forming layers according to increasing density from the top. As a gas, water vapor is completely miscible with air. On the other hand the maximum water vapor pressure that is thermodynamically stable with the liquid (or solid) at a given temperature is relatively low compared with total atmospheric pressure. 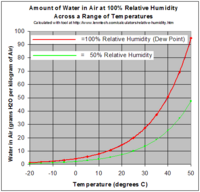 For example, if the vapor partial pressure is 2 percent of atmospheric pressure and the air is cooled from 25 °C, starting at about 22 °C water will start to condense, defining the dew point, and creating fog or dew. The reverse process accounts for the fog burning off in the morning. If one raises the humidity at room temperature, say by running a hot shower or a bath, and the temperature stays about the same, the vapor soon reaches the pressure for phase change, and condenses out as steam. A gas in this context is referred to as saturated or 100 percent relative humidity, when the vapor pressure of water in the air is at the equilibrium with vapor pressure due to (liquid) water; water (or ice, if cool enough) will fail to lose mass through evaporation when exposed to saturated air. Because the amount of water vapor in air is small, relative humidity, the ratio of the partial pressure due to the water vapor to the saturated partial vapor pressure, is much more useful. Water vapor pressure above 100 percent relative humidity is called super-saturated and can occur if air is rapidly cooled, say by rising suddenly in an updraft. Water is found in a variety of locations on Earth, in solid, liquid, and gaseous states. Accordingly, it is known by different names: water vapor and clouds in the sky; seawater and icebergs in the ocean; glaciers and rivers in the mountains; and aquifers in the ground. About 1,460 teratonnes (Tt) of water covers about 71 percent of the Earth's surface. Saltwater oceans hold 97 percent of surface water, glaciers and polar ice caps 2.4 percent, and other land surface water such as rivers and lakes 0.6 percent. It is thought that much of the universe's water may have been produced as a by-product of star formation. The birth of a star is accompanied by a strong outward wind of gas and dust. When this outflow of material eventually impacts the surrounding gas, the resultant shock waves compress and heat the gas. Water could be quickly produced in this warm, dense gas. The existence of liquid water, and to a lesser extent its gaseous and solid forms, on Earth is vital to the existence of life on Earth. 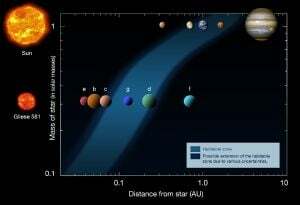 The Earth is located in the habitable zone of the Solar System. If it were slightly closer to or farther from the Sun (about 5 percent, or 8 million kilometers or so), the conditions that allow the three forms of water to be present simultaneously would be far less likely to prevail. Earth's mass allows its gravity to hold an atmosphere. Water vapor and carbon dioxide in the atmosphere provide a greenhouse effect that helps maintain a relatively steady surface temperature. If Earth were smaller, a thinner atmosphere would cause temperature extremes, preventing the accumulation of water except at the polar ice caps (as on Mars). If Earth were too massive, the water on it could have been in the solid state even at relatively high temperatures, because of the high pressure caused by gravity. It has been proposed that life itself may maintain the conditions that have allowed its continued existence. Earth's surface temperature has been relatively constant through geologic time, despite varying levels of incoming solar radiation (insolation), indicating that a dynamic process governs Earth's temperature via a combination of greenhouse gases and surface or atmospheric albedo. This proposal is known as the Gaia hypothesis. Rain refracts sunlight to produce this rainbow. Water runoff often collects over watersheds flowing into rivers. Some of this is diverted to irrigation for agriculture. Rivers and seas offer opportunity for travel and commerce. Through erosion, runoff shapes the environment creating river valleys and deltas that provide rich soil and level ground for the establishment of population centers. Some runoff water is trapped for periods, for example in lakes. In addition, snow and ice collect at the poles, on high mountains, and in other regions that experience cold winters. Water also infiltrates the ground and goes into aquifers. This groundwater later flows back to the surface in springs, or more spectacularly in hot springs and geysers. Groundwater may be extracted artificially by digging wells. These forms of water storage are important because clean, freshwater is essential for human and other land-based life forms. In many parts of the world, freshwater is in short supply. Snowflakes by Wilson Bentley, 1902. Given that water can dissolve many different substances, it acquires different tastes and odors. In fact, humans and animals have developed senses to be able to evaluate the potability of water. Animals generally dislike the taste of salty sea water and the putrid swamps and favor the purer water of a mountain spring or aquifer. The taste advertised in spring water or mineral water derives from the minerals dissolved in it, as pure H2O is tasteless. The "purity" of spring and mineral water refers to the absence of toxins, pollutants, and harmful microbes. Water has many distinct properties that are critical for the proliferation of all known forms of life, setting it apart from other substances. It is vital both as a solvent in which many of the body's solutes dissolve and as an essential part of many metabolic processes within the body, including reactions that lead to cellular replication and growth. Metabolism is the sum total of anabolism and catabolism. In anabolism, water is removed from molecules (through energy-requiring enzymatic reactions) to build larger molecules (such as starches, triglycerides, and proteins for storage of fuels and information). In catabolism, water is used to break bonds, to generate smaller molecules (such as glucose, fatty acids, and amino acids). Water is thus essential and central to these metabolic processes. Without water, these metabolic processes would cease to exist. Biochemical reactions take place in water at specific pH values. For instance, human enzymes usually perform optimally around a pH of 7.4. Digestion of food in the stomach requires the activity of an acid (hydrochloric acid, HCl). Some people suffer from what is called "acid reflux," in which the stomach acid makes its way into and adversely affects the esophagus. This condition can be temporarily neutralized by ingestion of a base such as aluminum hydroxide to produce the neutral molecules of water and aluminum chloride (a salt). Water is also central to photosynthesis and respiration. Photosynthetic cells use the Sun's energy to split off water's hydrogen from oxygen. Hydrogen is combined with carbon dioxide (absorbed from air or water) to form glucose and release oxygen. All living cells use such fuels and oxidize the hydrogen and carbon to capture the Sun's energy and reform water and carbon dioxide in the process (cellular respiration). Some marine diatoms - a key phytoplankton group. Earth's waters are filled with life. Nearly all fish live exclusively in water, and many marine mammals, such as dolphins and whales, also live in the water. Some kinds of animals, such as amphibians, spend portions of their lives in water and portions on land. Plants such as kelp and algae grow in the water and are the basis for some underwater ecosystems. Plankton is generally the foundation of the ocean food chain. Different water creatures use different ways of obtaining oxygen in the water. Fish have gills instead of lungs, although some species of fish, such as the lungfish, have both. Marine mammals, such as dolphins, whales, otters, and seals, need to surface periodically to breathe air. Civilization has historically flourished around rivers and major waterways. Mesopotamia, the so-called cradle of civilization, was situated between the major rivers Tigris and Euphrates; the ancient Egyptians depended greatly upon the Nile. Large metropolitan areas like Rotterdam, London, Montreal, Paris, New York City, Shanghai, Tokyo, Chicago, Mumbai, and Hong Kong owe their success in part to their easy accessibility via water and the resultant expansion of trade. Islands with safe water ports, like Singapore, have flourished for the same reason. In regions such as North Africa and the Middle East, where freshwater is relatively scarce, access to clean drinking water has been a major factor in human development. Water fit for human consumption is called drinking water or potable water. Water that is not potable can be made potable by various methods, including: filtration, to remove particulate impurities; chemical or heat treatment, to kill bacteria; and distillation, to separate water from impurities by vaporization and condensation. It should be noted, however, that some solutes in potable water are acceptable and even desirable for taste enhancement and to provide needed electrolytes. Water that is not fit for drinking but is not harmful if used for swimming or bathing is sometimes called "safe water" or "safe for bathing." Chlorine, a skin and mucous membrane irritant, is used to make water safe for bathing or drinking. Its use is highly technical and is usually monitored by government regulations (typically 1 part per million (ppm) for drinking water, and 1-2 ppm of chlorine not yet reacted with impurities for bathing water). A manual water pump in China. About 70 percent of the fat-free mass of the human body is made of water. To function properly, the body requires between one and seven liters of water per day to avoid dehydration; the precise amount depends on the level of activity, temperature, humidity, and other factors. Most of this is ingested through foods or beverages other than drinking straight water. It is not clear how much water intake is needed by healthy people. For those who have healthy kidneys, it is rather difficult to drink too much water, but (especially in warm humid weather and while exercising) it is dangerous to drink too little. People can drink far more water than necessary while exercising, however, putting them at risk of water intoxication, which can be fatal. The "fact" that a person should consume eight glasses of water per day cannot be traced back to a scientific source. There are other myths such as the effect of water on weight loss and constipation that have been dispelled. Original recommendation for water intake in 1945 by the Food and Nutrition Board of the National Research Council read: "An ordinary standard for diverse persons is 1 milliliter for each calorie of food. Most of this quantity is contained in prepared foods." The latest dietary reference intake report by the United States National Research Council in general recommended (including food sources): 2.7 liters of water total for women and 3.7 liters for men. Specifically, pregnant and breastfeeding women need additional fluids to stay hydrated. According to the Institute of Medicine—who recommend that, on average, women consume 2.2 liters and men 3.0 liters—this is recommended to be 2.4 liters (approx. 9 cups) for pregnant women and 3 liters (approx. 12.5 cups) for breastfeeding women, since an especially large amount of fluid is lost during nursing. Also noted is that normally, about 20 percent of water intake comes from food, while the rest comes from drinking water and beverages (caffeinated included). Water is excreted from the body in multiple forms: through urine, feces, sweating, and exhalation of water vapor in the breath. With physical exertion and heat exposure, water loss will increase and daily fluid needs may increase as well. The single largest freshwater resource suitable for drinking is Lake Baikal in Siberia, which has a very low salt and calcium content and is very clean. In many developing nations, irrigation accounts for over 90 percent of water withdrawn from available sources for use. In England, where rain is abundant year round, water used for agriculture accounts for less than 1 percent of human usage. Yet even on the same continent, water used for irrigation in Spain, Portugal and Greece exceeds 70 percent of total usage. Irrigation has been a key component of the "green revolution," which has enabled many developing countries to produce enough food to feed everyone. More water will be needed to produce more food for 3 billion more people. But increasing competition for water and inefficient irrigation practices could constrain future food production. Water is important for washing the human body and everyday items such as clothes, floors, cars, food, and pets. On April 7, 1795, the gram was defined in France to be equal to "the absolute weight of a volume of pure water equal to a cube of one hundredth of a meter, and to the temperature of the melting ice." For practical purposes though, a metallic reference standard was required, one thousand times more massive, the kilogram. Work was therefore commissioned to determine precisely how massive one liter of water was. In spite of the fact that the decreed definition of the gram specified water at 0 °C—a highly stable temperature point—the scientists chose to redefine the standard and to perform their measurements at the most stable density point: the temperature at which water reaches maximum density, which was measured at the time as 4 °C. Boiling, steaming, and simmering are popular cooking methods that often require immersing food in water or its gaseous state, steam. Water is also used in industrial contexts as a coolant, and in almost all power-stations as a coolant and to drive steam turbines to generate electricity. In the nuclear industry, water can also be used as a neutron moderator. Humans use water for many recreational purposes, as well as for exercising and sports. Some of these include swimming, waterskiing, boating, fishing, and diving. In addition, some sports, like ice hockey and ice skating, are played on ice. Likewise, sports such as skiing or snowboarding require the water to be frozen. Many use water for play fighting, such as with snowballs, water guns, or water balloons. 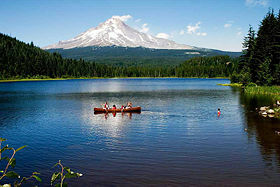 Lakesides and beaches are popular places for people to go for recreation and relaxation. Many find the sound of flowing water to be calming. Some keep fish and other life in water tanks or ponds for show, fun, and companionship. People also make fountains and use water in their public or private decorations. Pressurized water is used in water blasting and water jet cutters. Also, high-pressure water guns are used for precise cutting. It is also an effective coolant for various machines that generate heat during operation. It works very well, is relatively safe, and is not harmful to the environment. Water plays many critical roles within the field of food science. Food scientists need to understand the roles of water in food processing, to ensure the success of their products. Solutes such as salts and sugars found in water affect the physical properties of water. The boiling and freezing points of water is affected by solutes. One mole of sucrose (sugar) raises the boiling point of water by 0.52 °C, and one mole of salt raises the boiling point by 1.04 °C while lowering the freezing point of water in a similar way. Solutes in water also affect water activity which affects many chemical reactions and the growth of microbes in food. Water activity can be described as a ratio of the vapor pressure of water in a solution to the vapor pressure of pure water. Solutes in water lower water activity. This is important to know because most bacterial growth ceases at low levels of water activity. Not only does microbial growth affect the safety of food but also the preservation and shelf life of food. Water hardness is also a critical factor in food processing. It can dramatically affect the quality of a product as well as playing a role in sanitation. Water hardness is classified based on the amounts of removable calcium carbonate salt it contains per gallon. Water hardness is measured in grains; 0.064 g calcium carbonate is equivalent to one grain of hardness. Water is classified as soft if it contains 1 to 4 grains, medium if it contains 5 to 10 grains and hard if it contains 11 to 20 grains. The hardness of water may be altered or treated by using a chemical ion exchange system. The hardness of water also affects its pH balance which plays a critical role in food processing. For example, hard water prevents successful production of clear beverages. Water hardness also affects sanitation; with increasing hardness, there is a loss of effectiveness for its use as a sanitizer. Hydroelectricity is electricity obtained from hydropower. Hydroelectric power comes from water driving a turbine connected to a generator. Hydroelectricity is a low-cost, non-polluting, renewable energy source. People wait in line to gather water, during the Siege of Sarajevo. Water in itself is not a finite resource (like petroleum is). The water cycle, which involves evaporation, condensation, and precipitation, regenerates potable water in large quantities, many orders of magnitude higher than human consumption. However, many parts of the world are experiencing water scarcity, in the sense that there are problems with the distribution of potable and irrigation water. Such shortages of water form a major social and economic concern and have led to disputes between nations that rely on the same source of water (such as the same river). Some countries experiencing water shortages import water or purify seawater by desalination. Currently, about 1 billion people around the world routinely drink unhealthy water. Poor water quality and bad sanitation are deadly; some 5 million deaths a year are caused by polluted drinking water. In the developing world, 90 percent of all wastewater goes untreated into local rivers and streams. Some 50 countries, with roughly a third of the world’s population, also suffer from medium or high water stress, and a number of them extract more water annually than is recharged through their natural water cycles. The strain affects surface freshwater bodies like rivers and lakes, but it also degrades groundwater resources. Water is a strategic resource in the globe and an important element in many political conflicts. Some have predicted that clean water will become the "next oil," making Canada, with this resource in abundance, possibly the richest country in the world. There is a long history of conflict over water, including efforts to gain access to water, the use of water in wars started for other reasons, and tensions over shortages and control. UNESCO's World Water Development Report (WWDR, 2003) from its World Water Assessment Program indicates that, in the next 20 years, the quantity of water available to everyone is predicted to decrease by 30 percent. About 40 percent of the world's inhabitants currently have insufficient fresh water for minimal hygiene. More than 2.2 million people died in 2000 from diseases related to the consumption of contaminated water or drought. In 2004, the UK charity WaterAid reported that a child dies every 15 seconds from easily preventable water-related diseases; often this means lack of sewage disposal; see toilet. Ninety-five percent of freshwater in the United States is underground. One crucial source is a huge underground reservoir, the 1,300-kilometer (800 mi) Ogallala aquifer which stretches from Texas to South Dakota and waters one fifth of U.S. irrigated land. Formed over millions of years, the Ogallala aquifer has since been cut off from its original natural sources. It is being depleted at a rate of 12 billion cubic meters (420 billion ft3) per year, amounting to a total depletion to date of a volume equal to the annual flow of 18 Colorado Rivers. Some estimates say it will dry up in as little as 25 years. Many farmers in the Texas High Plains, which rely particularly on the underground source, are now turning away from irrigated agriculture as they become aware of the hazards of overpumping. The Middle East region has only 1 percent of the world's available freshwater, which is shared among 5 percent of the world's population. Thus, in this region, water is an important strategic resource. It is predicted that by 2025, countries of the Arabian peninsula will be using more than twice the amount of water naturally available to them. According to a report by the Arab League, two-thirds of Arab countries have less than 1,000 cubic meters (35,000 ft3) of water per person per year available, which is considered the limit. In Asia, Cambodia and Vietnam are concerned about attempts by China and Laos to control the flux of water. China is preparing the Three Gorges Dam project on the Yangtze River, which would become the world's largest dam, causing many social and environmental problems. It also has a project to divert water from the Yangtze to the dwindling Yellow River, which feeds China's most important farming region. 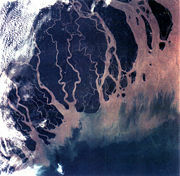 The Ganges is disputed between India and Bangladesh. The water reserves are being quickly depleted and polluted, while the glacier feeding the sacred Hindu river is retreating hundreds of feet each year, causing subsoil streams flowing into the Ganges river to dry up. In South America, the Guaraní Aquifer is located between the Mercosur countries of Argentina, Brazil, Bolivia and Paraguay. With a volume of about 40,000 km³, it is an important source of fresh potable water for all four countries. Drinking water is often collected at springs, extracted from artificial borings in the ground, or wells. Building more wells in adequate places is thus a possible way to produce more water, assuming the aquifers can supply an adequate flow. Other water sources are rainwater and river or lake water. This surface water, however, must be purified for human consumption. This may involve removal of undissolved substances, dissolved substances and harmful microbes. Popular methods are filtering with sand which only removes undissolved material, while chlorination and boiling kill harmful microbes. Distillation does all three functions. More advanced techniques are also available, such as reverse osmosis. Desalination of seawater is a more expensive solution, but it is used in some coastal areas with arid climates because the water is abundantly available. Reducing waste by using drinking water only for human consumption is another option. In some cities such as Hong Kong, seawater is extensively used for flushing toilets to conserve freshwater resources. Polluting water may be the biggest single misuse of water; to the extent that a pollutant limits other uses of the water, it becomes a waste of the resource, regardless of benefits to the polluter. Like other types of pollution, this does not enter standard accounting of market costs, being conceived as externalities for which the market cannot account. Thus other people pay the price of water pollution, while the private firms' profits are not redistributed to the local people who are victims to this pollution. Pharmaceuticals consumed by humans often end up in the waterways and can have detrimental effects on aquatic life if they bioaccumulate. A Hindu ablution as practiced in Tamil Nadu. In most religions, water is considered a purifier in an internal, spiritual sense as well as in an external, physical sense. Faiths that incorporate ritual washing (ablution) include Hinduism, Christianity, Islam, Judaism, Zoroastrianism, and Shinto. Water is mentioned in the Bible 442 times in the New International Version and 363 times in the King James Version. For example, 2 Peter 3:5(b) states, "The earth was formed out of water and by water" (NIV). Water baptism is a central sacrament of Christianity. It is also a part of the practice of other religions, including Judaism (mikvah) and Sikhism (Amrit Sanskar). In Zoroastrianism, one is expected to wash one's hands and face before praying in the fire temple. Likewise, in Islam, the five daily prayers can be offered in most cases after washing certain parts of the body with clean water (wudu). In Shinto, water is used in almost all rituals to cleanse a person or area (such as in the ritual of misogi). In addition, a ritual bath in pure water is performed for the dead in many religions, including Judaism and Islam. Some faiths use water especially prepared for religious purposes—holy water in some Christian denominations; Amrit in Sikhism and Hinduism. Many religions also consider particular sources or bodies of water to be sacred or at least auspicious. Examples include Lourdes in Roman Catholicism, the Zamzam Well in Islam, and the River Ganges (among many others) in Hinduism. In Neo-Paganism water is often combined with salt in the first steps of a ritual, to act as a purifier of worshippers and the altar, symbolizing both cleansing tears and the ocean. 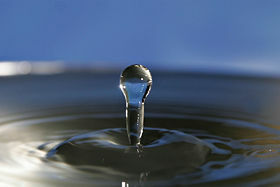 Water is often believed to have spiritual powers. In Celtic mythology, Sulis is the local goddess of thermal springs; in Hinduism, the Ganges is also personified as a goddess, while Saraswati has been referred to as a goddess in Vedas. Also water is one of the "panch-tatva"s (basic 5 elements, others including fire, earth, space, air). Alternatively, gods can be patrons of particular springs, rivers, or lakes. For example, in Greek and Roman mythology, Peneus was a river god, one of the three thousand Oceanids. In Islam, not only does water give life, but every life is itself made of water: "We made from water every living thing". The Greek philosopher Empedocles held that water is one of the four classical elements along with fire, earth and air, and was regarded as the ylem, or basic substance of the universe. Water was considered cold and moist. In the theory of the four bodily humors, water was associated with phlegm. Water was also one of the five elements in traditional Chinese philosophy, along with earth, fire, wood, and metal. ↑ Laurence D. Barron, Lutz Hecht, and Gary Wilson, The Lubricant of Life: A Proposal That Solvent Water Promotes Extremely Fast Conformational Fluctuations in Mobile Heteropolypeptide Structure. ACS Publications, 1997. Retrieved June 28, 2017. ↑ Laura Blue, Water Found on Distant Planet TIME, 2007. Retrieved June 28, 2017. ↑ Ker Than, Water Found in Extrasolar Planet's Atmosphere. Space.com, April 10, 2007. Retrieved June 28, 2017. ↑ Charles L. Braun, Sergei N. Smirnov, Why is water blue? J. Chem. Educ. 70(8) (1993):612. Retrieved June 28, 2017. ↑ P.G. Debenedetti, and H.E. Stanley. 2003. Supercooled and Glassy Water. Physics Today 56(6):40–46. ↑ 6.0 6.1 Oliver Schlüter, Impact of High Pressure — Low Temperature Processes on Cellular Materials Related to Foods. Technischen Universität Berlin, 2003. Retrieved June 28, 2017. ↑ Gustav Tammann The States Of Aggregation. (Constable And Company Limited, 1925). ↑ William Cudmore McCullagh Lewis, and James Rice, A System of Physical Chemistry. (London, UK: Longmans, Green and co., 1922). ↑ The pressure due to water vapor in the air is called the partial pressure(Dalton's law) and it is directly proportional to concentration of water molecules in air (Boyle's law). ↑ Adiabatic cooling resulting from the ideal gas law. ↑ One tonne (or metric ton) is defined as 1000 kilograms (kg) or 1 megagram (Mg). One teratonne is equal to 1012 tonnes. ↑ Gary Melnick and David Neufeld, Space Cloud Holds Enough Water to Fill Earth's Oceans 1 Million Times, Headlines@Hopkins, JHU, 1999. Retrieved June 28, 2017. ↑ E. Ehlers, T. Krafft (eds. ), Understanding the Earth System: compartments, processes, and interactions. (New York, NY: Springer, 2001). ↑ Habitable Zone. The Encyclopedia of Astrobiology, Astronomy and Spaceflight. Retrieved June 28, 2017. ↑ Heinz Valdin, "Drink at least eight glasses of water a day." Really? Is there scientific evidence for "8 × 8"? Department of Physiology, Dartmouth Medical School. Retrieved June 28, 2017. ↑ Drinking Water - How Much?. Factsmart.org. Retrieved June 28, 2017. ↑ Food and Nutrition Board, National Academy of Sciences. Recommended Dietary Allowances, revised 1945. National Research Council, Reprint and Circular Series. 122:3-18. ↑ Dietary Reference Intakes: Water, Potassium, Sodium, Chloride, and Sulfate. Food and Nutrition Board, National Institute of Medicine, 2005. Retrieved June 28, 2017. ↑ Water: How much should you drink every day? Mayo Clinic. Retrieved June 28, 2017. ↑ "The World's Water,"A Chronology of Water-Related Conflicts. Pacific Institute. Retrieved June 28, 2017. ↑ Ogallala aquifer - Water hot spots. BBC News. Retrieved June 28, 2017. ↑ Water shortages 'foster terrorism'. BBC News. Retrieved June 28, 20177. Anderson, Terry L. Water Rights: Scarce Resource Allocation, Bureaucracy, and the Environment. Cambridge, MA: Ballinger Pub. Co., 1991. ISBN 0884103900. Barlow, Maude, Tony Clarke. Blue Gold: The Fight to Stop the Corporate Theft of the World's Water. New York, NY: New Press (distributed by W.W. Norton), 2003. ISBN 1565847318.
de Villiers, Marq. Water: The Fate of Our Most Precious Resource. Toronto, ON: M&S, 2003. ISBN 0771026412. Debenedetti, P.G., and H.E. Stanley. Supercooled and Glassy Water. Physics Today 56(6) (2003):40–46. Retrieved June 28, 2017. DeMan, John M. Principles of Food Chemistry 3rd Edition. Gaithersburg, MD: Aspen Publishers, 1999. ISBN 083421234X. Ehlers, Eckart, and T. Krafft (eds.). Understanding the Earth System: compartments, processes, and interactions. New York, NY: Springer,2001. ISBN 3540675159. Franks, F. (ed.). Water, A comprehensive treatise. New York, NY: Plenum Press, 1982. ISBN 0306407108. Gleick, Peter H. The World's Water: The Biennial Report on Freshwater Resources. Washington, DC: Island Press, 2006. ISBN 978-1597261050. Jones, O.A., J.N. Lester and N. Voulvoulis. Pharmaceuticals: a threat to drinking water? TRENDS in Biotechnology 23(4) (2005):163. Lowi, Miriam R. Water and Power: The Politics of a Scarce Resource in the Jordan River Basin. New York, NY: Cambridge University Press, 1995. ISBN 0521431646. Postel, Sandra. Last Oasis: Facing Water Scarcity. New York, NY: Norton Press, 1997. ISBN 0393317447. Reisner, Marc. Cadillac Desert: The American West and Its Disappearing Water. New York, NY: Penguin Books, 1993. ISBN 0140178244. Roddick, Anita et al. Troubled Water: Saints, Sinners, Truth And Lies About The Global Water Crisis. White River Jct., VT: Chelsea Green Publishing Company, 2004. ISBN 095439593X. Shiva, Vandana. Water Wars: Privatization, Pollution, and Profit. Cambridge, MA: South End Press, 2002. ISBN 0745318371. Vaclavik, Vickie A. and Elizabeth W. Christian. Essentials of Food Science, 2nd Edition. New York, NY: Kluwer Academic/Plenum Publishers, 2003. ISBN 0306473631. Ward, Diane Raines. Water Wars: Drought, Flood, Folly and the Politics of Thirst. New York. NY: Riverhead Books, 2002. ISBN 1573222291. Worster, Donald. Rivers of Empire: Water, Aridity, and the Growth of the American West. New York, NY: Pantheon Books, 1992. ISBN 039451680X. WaterAid - Charity dedicated to the provision of clean water, sanitation and hygiene education. Water and Steam Tables for Industrial Use. This page was last modified on 30 June 2017, at 17:01.